A lot of people think that wet wipes are made from toilet tissue and many people simply flush them down the toilet without a second thought. Millions of pounds are spent on cleaning drains and sewers right across the UK because of items that shouldn't be in them. Wet wipes, cotton wool, nappies, cotton buds, sanitary towels and dental floss are just some of the culprits. Things like wipes and nappies don't just disappear down the toilet and dissolve - they clump together and cause havoc in the sewers. This causes people complete misery when blocked drains and sewers cause their homes and gardens to flood. 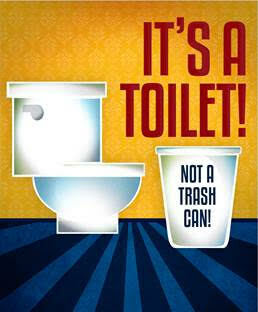 Please join the national ‘Bin it; don’t Flush It’ campaign to reduce blockages and protect the environment.